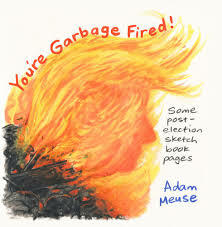 You're Garbage Fired!, by Adam Meuse. This is a collection of "some post-election sketchbook pages" by the talented and funny Meuse, published by Birdcage Bottom Books. 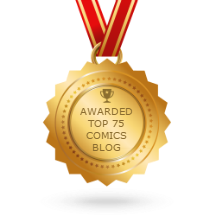 I believe this is the first time Meuse has been published by someone else, and it's certainly well-deserved. The drawings and strips here reflect the rage and despair felt by many in the wake of Donald Trump winning the presidency, and the mini is well-served by being in full-color. That makes the scatological joke of a soiled diaper strongly resembling the shape and color of Trump effective; it's not an especially smart take on Trump, but it certainly does reflect Meuse's visceral rage. His portraits of folks like Steve Bannon and Kelly Conaway have an almost undead feel to them: they are rotting human beings. Mike Pence bleeding from every pore is a genuinely unsettling image, as though he were an antichrist. Angry portraits of the president by his two young daughters and a final strip where he scrolls through the news of the day one last time and goes to bed, saying, "Ok, I sufficiently hate everything and everyone" cap the collection with the same kind of grim but bright humor. Meuse is an incredible caricaturist, but it's the way he captures the essential awfulness of each figure that's really impressive. The only artist doing something comparable is Warren Craghead, who draws grotesque caricatures of Trump and his lackeys every day. Cats Of The White House and The Hanukkah Fire, 1992, by Rachel Scheer. 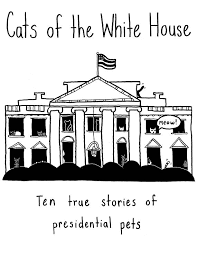 The first mini was written by Danny Noonan and drawn by Scheer, and it's really an illustrated zine about presidential cats. It's interesting in the way it reveals a side of the presidents that's not widely known historically, even as "First Pets" command a great deal of attention from the press while their owners are in power. The stories about Abraham Lincoln being obsessed by his cats to the point where it annoyed his wife were amusing, as was the account of Teddy Roosevelt forbidding anyone on the White House staff from disturbing his cat at any time. Scheer works in a stripped-down, cartoony tradition where spotting blacks and slightly exaggerated facial expressions do much of the narrative heavy lifting. That's especially true in the latter comic, a charming memory of a long-ago Hanukkah caught on film and brought back to life here with the use of spot color and photo collage. The incident in question was really an excuse for Scheer to think about her family history and the ways in which ethnic practices supersede religious ones. She notes that her grandfather was a Polish refugee who wound up living in a community in Shanghai, China, which I found fascinating. There was a smooth, easy transition to that family history to the incident in question, in which a home-made menorah catches fire and gets tossed in the sink. It's a memory that's representative of the ways in which Scheer and her family felt Jewish even if they had no religious connection to the faith at all. Here, the gesture of the family trying to go through the ceremony with stuff made by the kids is more important than the actual ceremony itself. Scheer has a strong command over her page design even as her drawings mostly stay in the functional range. Again, she's not trying to dazzle the reader with her draftsmanship; instead, she's trying to clearly tell a story, and she uses a variety of approaches to do so clearly. 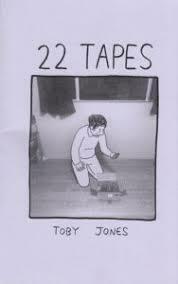 22 Tapes, by Toby Jones. I was delighted to see this comic show up in the mail, as Jones has mostly been working on animation projects for the past several years. 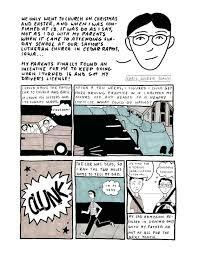 His Memory Foam minis were some of the most entertaining autobio comics I had ever read, so it was interesting to see him come back to it, albeit in a highly unusual fashion. The premise of the comic is that Jones got a bunch of Hi-8 tapes that he had made in his childhood digitized, and he had the idea of watching them one-by-one and improvise comics with regard to what he remembered and felt of the tapes. He was between 11 and 17 when he made these tapes, and the result was unearthing a lot of increasingly unpleasant memories of his life at that time. Jones zeroes in on the fact that his younger self was obsessed with the idea of creating entertainment. Whether it was in the form of skits, crude animations or childlike weirdness, his younger self just wanted to be on camera. Jones is unsparing in his commentary on his younger self, but he is happy when he managed to collaborate and put together something that was half-decent. That was especially true of some of those early animations, a few of which even had things like B-stories and callbacks. The comics sometimes went on tangents to discuss the relationships he had with certain friends and why some of those friendships faded. 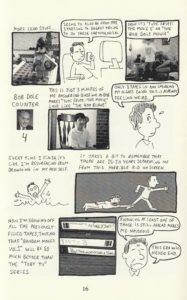 Eventually, Jones gets around to discussing why he was really doing this comic: after years of working as a professional animator to create a polished mainstream product, he wanted a chance to return to that essential urge to create something just for himself, without caring what anyone else thought of it. He revealed that at the time he was making the videos, he was being bullied in school and had a horrible home life. Those tapes were his only real escape at the time, as they gave him a chance to exercise total control of his environment. Jones gave himself that same kind of relief in doing this comic, only this time it was relief from the pressure of having his work scrutinized, edited and controlled. What's most interesting about this mix of still photos from films and Jones' own drawings is that Jones didn't consciously go into it knowing how emotional and exhausting reliving the past would be. At the same time, the way he wrote about these emotions was hilarious. This was an interesting experiment that bore some fascinating fruit.